Each of Marlene’s Gang members were created as bespoke commissions of individual animals. Taking into account the dog or cats personality the image is hand drawn from a selection of photographic references. The sugar skull decorations are chosen to suit the image and then hand drawn on. All colours are digitally added to finish off the commission. 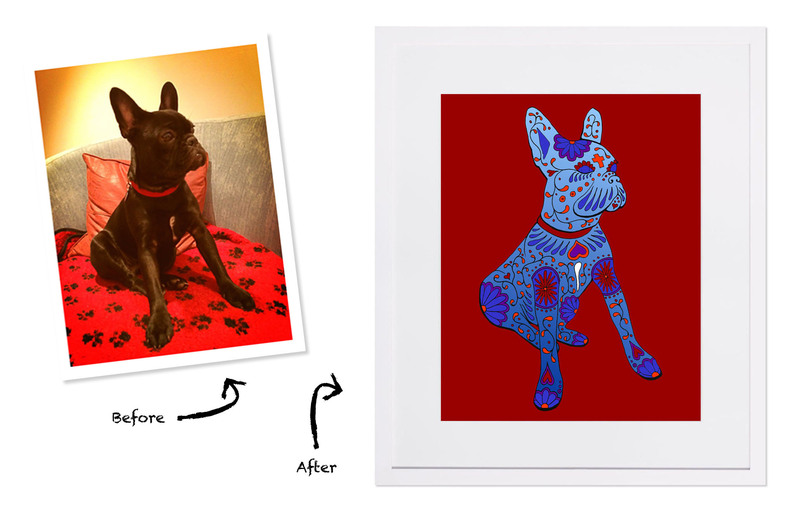 Bespoke commissions are £95.00 for a single pet, and £125.00 for multiple pets on a group illustration. This included an A4 mounted print on archival paper (with free delivery within the UK). Each commission will also feature on our website with their own page write up, forever making them an official member of Marlene’s Gang. If you are interested in getting your own pet into Marlene’s Gang then simply get in touch through our website. Alternatively you can purchase the bespoke commission through our online shop, and we will be in touch straight after to collect photos from you. © Marlene’s Gang – Illustration by Leila Talmadge. All rights reserved.